This project to remake two pieces from Habitat for Humanity was a lot of fun to do but holy smokes it was a lot of work. Kudos and a whole new appreciation to people that upcycle furniture! It is HARD! What I started with was not what I ended up with. Mostly because I broke my first piece and had to go shopping again. See. DIY is HARD! But then I got in a groove and it got easier and easier. Check out the transformations below and don't forget to stop by the Edmonton Fall Home Show 2017 DIY Inspirations – Notable Nightstands project presented by Rust-Oleum and Habitat for Humanity to bid on your favourite. 100% of proceeds will go to Habitat for Humanity. There are quite a few neat pieces made by local experts so I am really looking forward to going to the show myself to see what the others created! The show runs this weekend (October 20th-22nd) at Northlands in Edmonton. I started off with using this Rust-Oleum Krud Kutter on both the tables. It took off the grime and gloss that was on them which let me skip the sanding part. So worth it! You just put this on and wipe it down in circles followed by a wipe with a clean cloth. It is amazing how much stuff it takes off for you! See? Gross. This was one wipe! And ready to go. Like my painting booth??? Dollar store table cloth and painters tape FTW! 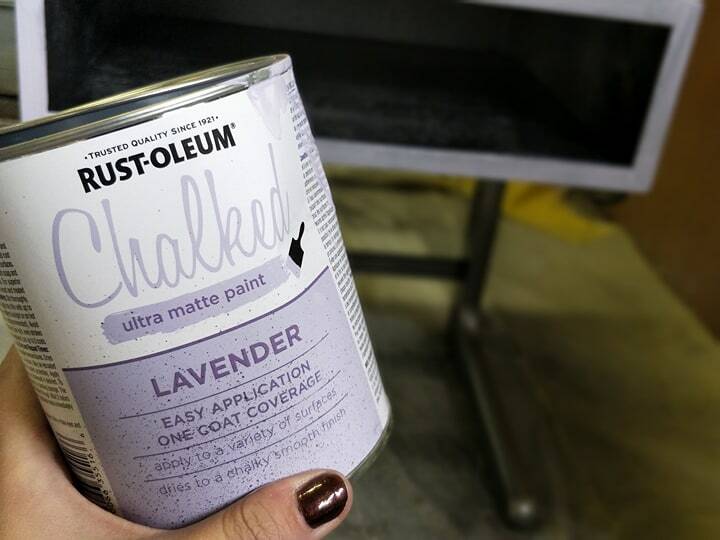 I chose this Lavender Chalked paint for the grownups table. The colour is soft and calming exactly what a grownups oasis should be. I then used this metal paint for the legs to make it a bit more fun and funky. The finish of this forged metal paint is very cool. I couldn't capture it on camera but it has a cool pebbled texture to it. For the kids table I wanted BRIGHT and FUN! This ink blue paint from Rust-Oleum was perfect. It went on so quick and I only did a second coat because my painting skills need work and I missed a couple of spots the first time around. My kids are Lego obsessed so I wanted to incorporate it in the table somehow. I love this tape and the creativity it brings so I thought I'd add some along the sides as well as a Lego platform right on the table for those special projects the kids build. I found the tape at Wal-Mart and cut it to fit at home. The one side has adhesive on it letting it stick to any surface. And that's it! They are done and at the Edmonton Fall Home Show ready to be bid on!